This is the first of a two part post summarising my presentation to the Red Paper conference in Glasgow on the fiscal implications of constitutional change. Lets start by recognising, that whatever the criticism, the Scotland Act 2012 does give the Scottish Parliament significant new fiscal powers. A Scottish income tax to replace part of the UK income tax; the devolution of stamp duty land tax and landfill tax; the power to create or devolve other taxes to the Scottish Parliament; new borrowing powers (although only a consultation on bonds); and a Scottish cash reserve to manage fluctuations in devolved tax receipts. In addition we already have the Council Tax and business rates. There remains the thorny issue of political willingness to creatively use these powers, but I will return to that later. “monetary union would also entail co-ordination, if not integration of fiscal policy”, then “the burden of any adjustment that would be required to restore competitiveness in the traded sector would fall on nominal wages”. We only have to look at the Eurozone crisis debate to see the link between monetary and fiscal policy. For an SNP government to support regulation from London, which will very much be in the interests of those institutions, is bizarre. Of course all of this depends on rUK allowing an independent Scotland to pick and choose bits it wants to keep. If the key economic levers in hands of another country, then there is less influence on monetary, and fiscal, policy than under devolution. However, my biggest difficulty is with the concept of a ‘fiscal edge’. It appears that SNP policy is still wedded to Celtic tiger strategy. Even if desirable, you simply cannot replicate 1990’s Ireland. 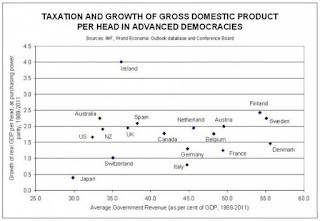 Other small countries like Denmark, Norway, Sweden, Finland all have higher Corporation Tax and better performing economies. The UK business tax rate already low. The evidence that tax cuts pay for themselves (Laffer curve) is simply not there. Any saving goes into profit not investment and many of our companies are sitting on vast cash reserves already. There will certainly be a huge hit on public finances that is unsustainable. A better way, as the Stephen Boyd and others have pointed out is actually higher taxation to fund investment in people, plant, infrastructure and research. The Laffer curve theorists that promote this view would also apply it to personal taxation. In particular they oppose progressive taxation and promote the flat tax approach as Laffer set out himself in an interview on Radio 4 this week. 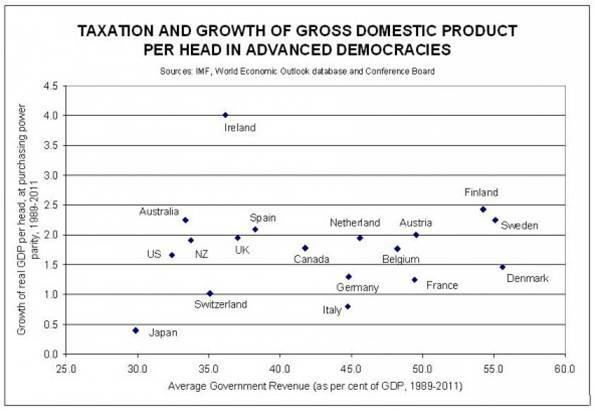 Again as the table below shows there is no link between different levels of taxation and economic growth. While I am not aware of SNP spokespersons advocating this approach, it would be consistent with the policy of business taxes and needs to be clarified in the White Paper. So what about the extended devolution options? “there is no clear pattern from comparative analysis that winning or having greater fiscal autonomy policy is beneficial to economic growth”. Then we have Devo-Plus. This proposal argues that most revenues would be raised in Scotland to pay for devolved services with VAT and NI retained at UK level to pay for reserved services. Again the mechanisms have been worked out in some detail. What is less clear is the purpose of this devolution. For that we need to look at the authors, Reform Scotland, objectives that are the apparently, “traditional Scottish principles of limited government, diversity and personal responsibility". Translated this means- small state, privatisation and blame the poor! In summary, none of the above meet the key test of devolution for the purpose of creating a more equal society and investment in our people. They ignore issues of class and class power. In part 2, I will set out some possible different fiscal approaches. Today the Scottish Parliament concluded its consideration of the Police and Fire Reform Bill. The Bill centralises police and fire services in Scotland, removing them from local authority control. While many of the concerns also apply to fire, it is the policing elements that have been the most controversial. police plans. However, as the new Scottish Police Authority and Chief Constable have the power of direction, this is likely to be little more than cosmetic due to the command and control culture of a uniformed service. Britain has, for good reason, a history of local policing. This structure gives a government minister very considerable powers to influence and direct policing in Scotland. I am not alone in regarding this as an unwelcome constitutional development. Local authorities will also reflect on the removal of more powers from local democratic control and the growing centralising tendency of this government. The main, arguably only justification for centralisation is cost saving. As Audit Scotland has warned, savings from public service reorganisation are far from guaranteed. MSPs today voted for the Bill without seeing the full business plan, a quite remarkable omission given this is the minister's raison d'être for change. The issue of VAT liability illustrates both the finance and the accountability issues. Despite the assurances given in the Policy Memorandum to the Bill, the Treasury made it clear from the outset that if you organise police and fire in this way you lose s33 exemptions. As a consequence Scotland is going to give the Teasury a £30-40m handout every year. If the new services had been organised as a joint board then this could have been avoided. But of course there would be less ministerial control. A very expensive way of shifting power to the centre. Also on finance, a recurring theme during the Bill's progress has been maintaining the artificial target for police officers, resulting in the loss of up to 3,000 police staff roles. Hundreds of police officers are already being taken off the street to back fill police staff jobs and this will rise further once the budget cuts kick in. This cannot possibly meet the best value provisions in the Bill. UNISON supports a balanced, modern police team, with the right skills and expertise for an effective police force. We need the skills of police staffs to enable police officers to do the job the public wants them to do, where they want them to do it – that is fighting crime, out on the streets. The new force should be able to set a balanced police staffing structure free from political direction on police officer numbers. I also believe this crazy policy will lead to the future privatisation of police services, despite the broad assurances given by the Cabinet Secretary. A clause in the Bill is specifically designed to facilitate the appointment of private contractors as police staffs. As I warned in evidence to the Justice Committee, it is inevitable that Audit Scotland will question the employment of police officers in civilian roles, at up to twice the cost, under best value provisions. As the new force is politically directed to maintain police officer numbers, the only way of squaring the circle is by the privatisation of significant police functions including custody and 999 calls. Again irrespective of best value considerations. So, overall a bad day for policing in Scotland and I predict one we will come to regret. The Treasury have issued a consultation paper today on bond issuance by the Scottish Government. This is very firmly consulting in the context of devolution with no reference to bond issuance under independence. The consultation has some significant limitations, primarily because it is not seeking views on the amount to be borrowed by this mechanism. Any bonds issued have to be within the limits imposed by the Scotland Act 2012’s overall limits on borrowing. At present these are set at 10% of the Scottish capital budget (around £230m in 2014/15) subject to an overall limit of £2.2bn. The paper argues that controls on borrowing are necessary for the UK’s fiscal credibility that benefits the Scottish economy. The primary means of borrowing is the National Loans Fund (NLF). The Scottish Government may, with Treasury approval, borrow from commercial banks, but not from other commercial sources. This power has to be viewed in the context of the Scotland Act 2012’s aim to devolve greater control of Scottish revenue raising. From April 2016, the Scottish Parliament will move from raising less than 15 per cent of its own budget to around 30 per cent. This will be achieved through the new Scottish rate of income tax (the 10p variation), devolution of land tax and landfill tax, the power to create or devolve other taxes, new borrowing powers and a Scottish cash reserve to manage volatility in devolved taxes. In cash terms, Scottish Ministers will control over £6 billion of tax revenues and they intend to establish a Scottish version of HMRC to administer this. UNISON Scotland has long argued for the power to issue bonds and believed it should have been introduced with the other Scotland Act powers. The consultation paper is predictably negative about this power and this reflects the conservative approach of HM Treasury to borrowing outwith central government. It is fair to state that bonds can be more expensive than the NLF and that is why local government rarely uses their powers to issue bonds. Bonds are a long term source of finance and allow access to wider pool of lenders. Importantly, these include the public and pension funds, giving a sense of civic pride in infrastructure projects. For this reason we believe that they could be particularly useful in financing capital investment by Scottish Water. Network Rail uses bond finance and because they are guaranteed by the government they attract AAA rating. Bonds at sub-sovereign level are common in the US, Canada, Germany and elsewhere across the world. The problem of a cost premium can be addressed by an explicit government guarantee. This is reasonable because central government is placing controls on the level of borrowing using this and other powers. I would argue that these limits should simply be prudential borrowing, i.e. that the Scottish Government can fund its capital costs from current revenue. However, for the purposes of this consultation, bonds would be included in the total borrowing limits in the Scotland Act. So the ‘moral hazard’ or risks the consultation paper emphasises would be minimal. It is somewhat ironic that the paper highlights the additional cost of commercial borrowing, as that is precisely what the UK and Scottish governments have been doing for years through PPP schemes. Overall, the consultation paper makes a grudging case for bond issuance and sets against that every possible negative scenario Treasury officials could possibly find. However, within their self imposed constraints these risks are marginal at worst. The gains from bond issuance may not be huge, but I would argue it is a worthwhile addition to the Scottish Government’s financial powers. I will cover this issue and the wider fiscal implications of constitutional change in my presentation to Saturday's Red Paper conference in Glasgow. At this week's Scotsman conference on the economics of independence David Watt of the Institute of Directors was yet again wheeled out to assert the primacy of the private sector and how it should take over the delivery of public services. "Moving the public sector to the status of a facilitator rather than the more expensive deliverer, this will see a real change in our economic landscape". Of course no evidence was offered on how this was going to miraculously change our economic landscape. In fact the only evidence he quoted was the failure of the private sector in this field of activity. Banks, care homes and PFI were accepted as failures, but apparently "we must learn from these lessons". Well, actually we have learned from these mightily expensive "lessons", and the conclusion is that the commercial realm should keep out of the public realm. The privatisers often invoke the Third Sector in this argument, knowing full well that this is simply a trojan horse to open up services to procurement challenge under EU rules. Now the arguments against privatisation have been well rehearsed including an even longer list of failures that David Watt admitted to. The evidence shows that once services are run for private profit, the quality of care and service is reduced, the workforce are adversely affected and local economies suffer. If you want more, one of many UNISON guides and case studies can be found here. The Jimmy Reid Foundation has also offered us a wider context this week with their scrutiny piece on the subject, "Reality is soo 2009". As Robin McAlpine puts it, "All public money is now being tested not for how well it can serve the public but for what scope there is to convert it into private profit. The private sector is unable and unwilling to grow the economy so it seeks to grow its profits by other means – by converting public asset to private profit". I am going to offer another argument against privatisation. It's actually very bad for the private sector as well. Instead of investing in their industry, private companies are being encouraged to cream off low risk tax revenues. In doing this they learn that it is easier to make profit from public commodities that we all need like health and education. No need to innovate new products for the consumer in an uncertain market. So not only does the taxpayer have to pay the profit premium, but privatisation undermines private sector innovation and investment in products that might usefully meet our needs. As others (Lansley, Murphy) have highlighted, companies have been gambling their cash rather than investing in manufacturing. As that strategy ran into trouble with the banking collapse, they need a new safe bet in the public sector. Scotland needs a vibrant, wealth producing private sector, investing in real goods and services. It shouldn't be chasing safe revenues at the taxpayers expense. In the wake of the 2011 Scottish Parliament elections there was a clear determination across the Scottish Labour Party to address the political and organising challenges facing the movement. While the Review of Labour in Scotland had a rocky start, it did result in changes that brought the party organisation into line with political devolution. In particular devolving the rule book and the election of a Leader of Scottish Labour. However, devolving power is not and end in itself. It requires us to consider what sort of Scottish Labour Party we want to develop and how we should organise to deliver that vision. The Revitalise Scottish Labour network was established in 2004 to promote greater democracy within the Party. It brought together a broad coalition in support of constitutional change to promote greater debate and transparency for individual members and affiliates. Much, but not all, of this agenda was achieved and party democracy improved thanks to a well organised, broad based network. Revitalise has always been a loose network that brought together party units and individuals, rather than creating another membership organisation. While Revitalise has traditionally focussed on constitutional change, there is a need to also focus on the battle of ideas. Defining and promoting a new vision for Scottish Labour. Re-energising the party means activists and potential new members need a cause to believe as an antidote to the markets and managerialism of New Labour. Such a vision would address our approach to constitutional change, the role of democratically accountable public services, the environment, social justice and the creation of a more equal society. While the recent Party rule changes are important, devolution in itself does not guarantee the sort of open democratic party the Revitalise network sought to create. This still requires debate and possibly further constitutional change. There is a need for greater transparency and engagement with the policy process and not just as part of the manifesto process. Recognising that there is simply not enough political debate at party meetings at all levels. Scottish Party conference is also still more of a rally than an engaging political experience. Other issues covered in the Review report also need careful thought including CLP organisation, candidate selection and the role of Local Campaign Forums. If genuine democratic socialist policies are to be adopted by Scottish Labour to revitalise the party, the ideas have to be generated and a level of organisation developed to deliver it. Policy generation on the left in Scotland has historically been limited. UK organisations like Compass and the Fabians have had a limited footfall in Scotland although efforts are being made to change that. Socialist societies (SHA, Co-op, SEA, SERA) play a role in specific fields and the Jimmy Reid Foundation has recently started. The right has established high profile think tanks including Reform Scotland, David Hume Institute and others. Then there are more neutral organisations like CSPP, IPPR North, Scottish Council Foundation etc. Debate and communications are another traditional weakness within Scottish Labour. Technology has started to change that through Facebook, Twitter and private initiatives like Labour Hame. STULP has also been more policy oriented in recent years. In media terms the Morning Star is growing its Scottish content. There is a growing policy community developing around blogs and other media. These can and should be developed to encourage members and supporters to make policy contributions. Following on from a well supported fringe meeting at the last Scottish Labour conference it was agreed that the Revitalise network would organise an event to address these issues. That will take place on Saturday 23 June 2012 at UNISON House in Glasgow starting at 1:30pm. Details on the Revitalise website. In fact it is a political buy one get one free day, as the Red Paper Collective are holding an event on constitutional change at the same venue in the morning. Hope to see people there for what promises to be an interesting day. At the Holyrood local government conference yesterday. A post election look at local government in Scotland. For those not familiar with recent developments Dave Berry from East Lothian gave a good overview of structures and roles. Reminding us that 75% of public services are delivered by councils. More than a few eyebrows were raised when he claimed ring fencing had been ended. Just what would you call the Council Tax freeze cash in return for police numbers etc - if not ring fencing. John Curtice did his usual analysis of the results. The SNP had a record local government result, but well down on last year's Scottish Parliament election - 45% to 32%. The key element of the story was the collapse of the Lib Dem vote and this followed on into the coalition agreements as the SNP lost a common coalition partner. In 2007 the share of parties in power was fairly even, but this year Labour gained a much larger proportion of councils. A point reinforced by several speakers was that parties can get on better at local level despite their national differences. He also introduced the concept of 'donkey voting'. His analysis shows that the alphabet matters with 64 SNP candidates being elected as against 12 lower on the ballot paper. For Labour the ratio was 51 - 12, probably reflecting better voter organisation as they also got more of their candidates elected. Although more analysis is needed here. The local government minister Derek MacKay reminded us how well the election was administered after the 2007 shambles. He gave a commitment that council boundaries would not be redrawn in the next 5 years, arguing that drawing lines on maps was a distraction from the key issues facing local government. The business rates review would be completed over the summer and community planning would have a harder edge. He made an interesting reference to using pension funds for infrastructure investment, something UNISON has been keen to explore in more detail. The next session started to open up more controversial issues with Henry McLeish raising concerns about the Council Tax freeze and centralisation. These concerns were also reflected in Rory Mair's CoSLA contribution. Henry was particularly good on citizens not consumers, warning the audience not to be beguiled by consultants. Both speakers highlighted the role of local government in tackling inequality. Scotland may be at the European average for many indicators at the median, but that declines rapidly in the bottom 20% income group. Rory Mair indicated that the elections might mean a more volatile relationship between CoSLA and central government. The centralising tendency will be contested as reform must be as much about democracy as efficiency. He gave a helpful indication of current thinking around the community planning review. The new arrangements are likely to adopt the Christie report proposals with a duty to participate, powers and the engagement of communities below council level. Following questions, the issue of common performance management arrangements is clearly still work in progress. All this looks positive, but still some way from the one public service recommended in Christie and floated by Robert Pyper in today's Scotsman. John Baillie of the Accounts Commission made the usual auditors call for more information. He also highlighted the issue of managerial capacity in councils after so many experienced staff have gone. Overall it would appear that local government is in for gradual reform based more on integration and community planning than structural change. Budget cuts will dominate the agenda and claimed efficiency measures had a very dated feel to them. Shared services in particular. While the Concordat and Single Outcome Agreements may be here to stay, there will be tensions between central and local government if they continue with a centralising agenda. Let's hope CoSLA does raise its voice in making the case for democratic local government. The future of Scottish Water makes a return to the political stage with Peter Jones's article in the Times and Willie Rennie's, albeit disguised, call for privatisation. Recent attempts to promote water privatisation are usually dressed up in the cloak of mutualisation or the Public Interest Company. There are in essence the same thing. It is dressed up as a policy compromise between the alleged inefficiency of the public sector and the worst aspects of unfettered privatisation. The key questions are who has the resources and capacity to invest in mutual assets, how would this investment be subscribed, and how would the governance and management of a mutual organisation deliver high quality water services at reasonable prices to Scottish water users? Attached to this are critical questions about the governance and accountability of a mutual water company in Scotland. The core issue is that of investment because of the scale of the capital programme needed to replace ageing infrastructure. The only obvious sources of funding for investment in a mutual water company in Scotland are from the private sector. Essentially mutualisation for the capital intensive Scottish water and sewage industry is simply a smokescreen for privatisation. The mutual body would in effect be owned by the financial institutions that provided (the more expensive) capital funds. To minimise financial risk they would insist that all services be provided by private contractors. Therefore the so-called mutual option is in reality a token representation for customers on a board overseeing a wholly privatised Scottish Water. This is what happens at Welsh Water creating a cosmetic mutual. To ensure democratic accountability Scottish Water should remain in the public sector where other interests can be represented through Parliament and locally. Water is not simply about customers seeking the cheapest possible water services as the Scottish Government's, albeit modest, Hydro Nation shows. Water users are also citizens who may be concerned with social equity and environmental justice. Mutualisation makes such objectives more difficult to achieve in practice. That is not to say that we should stick with the status quo. There is a need to establish an innovative, participatory, democratic system of public water management that is efficient, transparent and regulated and that respects the objectives of sustainable development in order to meet the population’s needs. Such an approach includes the democratisation of Scottish Water. This requires that it is put firmly into public ownership, meaning that Scottish Water operates not as if it was a private corporation, but as a public service. It would not be required to prioritise market efficiency over social or environmental efficiency. Bonds can be used to finance a public service without changing the ownership model. Scottish Water is a public service success story and goes with the grain of international developments in the industry. In Europe, South America and across the developing world nations and cities are turning away from market solutions in water. The English privatised industry has also been heavily criticised recently. The privatisers know this and that's why they are coming up with proposals like a public interest company that attempts to introduce privatisation through the back door. It's Scotland's water and it's not for sale.